We took the earliest flight out (6am) via Cebu Pacific and boy, was I dead tired! It was both dreading and exciting at the same time. Dreading because I hate waking up early and being sleep deprived; exciting because this was officially their first family trip with the children and with the extended family that is Yanyan and me. Meet the Bunch — (L-R) Niko, his mom, his brother Neil hugging his girlfriend Yanyan, Niko’s brother-in-law, Niko’s sister, Niko’s dad, little old me and the children Eliana and Ezra. We have all been awake since 3:30am and won’t be having any more sleep for the rest of the day. I had a full day of activities planned for everybody – Today was a Full-on tourist mode. Before anything, I strongly suggest you get your Octopus Cards at the airport. This link gives you all the information you need about it. From the Airport, we took the A21 Bus to Tsim Sha Tsui for $33 that took 40 minutes to reach our hotel in Nathan Road. The Airport Express would make a 20-minute difference in arrival with a significant difference in price so it was a no brainer to take the bus. 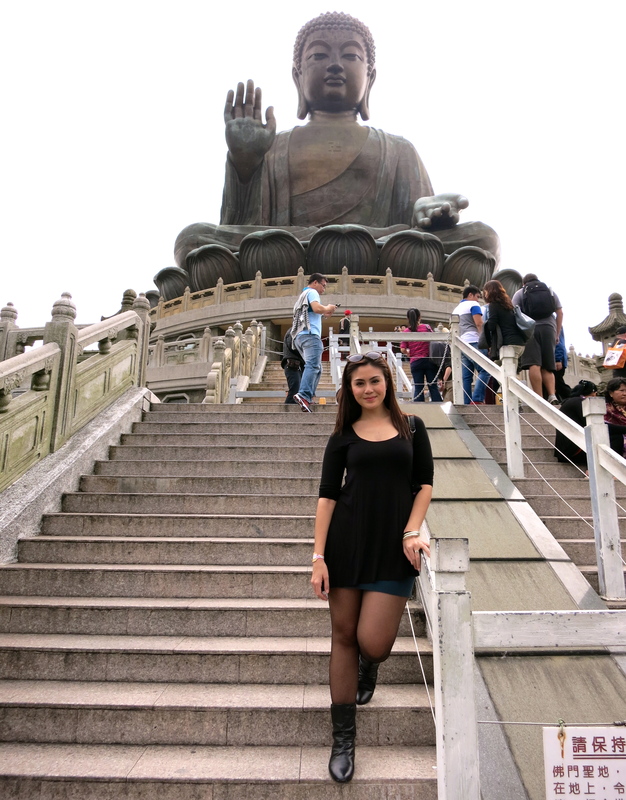 It also gave us a chance to relax while having our first glimpse of Hongkong. From Tsim Sha Tsui, we took the subway to Tung Chung ($7.50/way). Once you get to Tung Chung, the ever-tempting Citygate Outlets welcomes you with arms wide open. We successfully ignored the outlets and searched for signs leading to the “Ngong Ping Cable Car”. There are two ways to reach the Buddha: 1) is to take the bus that takes you at the foot of Ngong Ping Village, this saves you much dough, or 2) take the cable car, which gives you a remarkable view of Lantau Island – personally, I think it was worth every penny. We felt very courageous today so we chose to ride in a crystal cabin cable car- meaning the floor was entirely made of GLASS! As the cable car made its way across the green jungle of Hongkong, it took me a while before daring to look on the surface below; the site of it gave my entire body the electrifying feeling of shrills. It took 25 minutes for the cable car to cross 6KM of lush greenery before making its ending decent at the foot of Ngong Ping Village. Rested high on the hills of Lantau Island, the Big Buddha or known as the Tian Tan Buddha statue is one of the city’s most notable wonders and should be in anyone’s sightseeing list. Who wouldn’t want to pay a visit to the world’s biggest bronze Buddha? Walking up the 260 something steps up to the foot of the statue was not an easy thing to do but it was well worth the heart-pumping exercise. Second on the list was Victoria’s Peak. I had to learn the hard way that there are different ways to get to The Peak. 1.) The best way to make the most of your trip is to purchase a package ticket (HK$75). This includes the Peak Tram which gives you an unforgettable journey up to the Peak with a spectacular view of Hongkong (This takes approximately 10 minutes from Central Station to the Peak). Secondly, it permits you to climb up to the roof deck of the Peak Tower called the Sky Terrace. 2.) Another way to reach the Peak on a more affordable side is to take Bus #15 in Central Station for HK$9 one way. It takes around 45 mins and passes through the high-end residential area of Hongkong. If you don’t want to spend $40 to go to the Sky Terrace, you can enjoy the exact same view for free at the Lion’s Pavillon Lookout. We might have done only two things today but it was dead-tiring! I almost couldn’t feel my legs anymore form all the walking we did, not to mention I haven’t had any sleep yet. Last stop but certainly not the least was the Avenue of the Stars. The playful lights from the buildings will definitely leave you breathless. This is one of the views you’ll see that will stun you and will leave a mark. This was a good way to end our very hectic day. We were so close in choosing going to Macau for the day over Disneyland but the children were just too hard to say no to. They said “It would be better if we were all together”. Awww — it melted my heart! Since it was a family trip, we all stuck together and went to the happiest place on Earth. The ticket for Disneyland is HK$430 and the train from Tsim Sha Tsui to Disneyland was HK$18. The expression on the kids’ faces were priceless as they hopped in the Disneyland express and saw the Mickey Mouse windows on the train. THAT, for me was worth missing Macau for. The moment I saw the Disneyland Castle, I felt exactly the same as the little 9 year old me holding my dad’s hand, close to tears realising that my dreams were finally coming true the moment I stepped foot in Disneyland all those years ago. Hongkong Disneyland now has a lot to offer not just for kids but also for adults such as Toy Story Land, Mystic Mansion and a lot more. At 4pm, the Parade started. It was no electric parade but it sure was entertaining. Disneyland has and will always be the happiest place on Earth. This marine themed park has a lot to offer its guest from all ages. The park showcases animal exhibits such as the lazy pandas, the sharks and the penguins; It has thrill rides that will electrify you straight to the bones – from the Flash to the Abyss drop, the hair raiser that will literally leave your hair raised and the dragon for the beginners; lastly, the park also has numerous educational animal shows. After all these years, Ocean Park never ceases to amaze and all this for HK$300. It was truly an action-filled 3 day adventure with Niko’s family. No matter how hectic and tiring the trip was with all the activities we had going on, it was in simple words, an amazing family bonding.